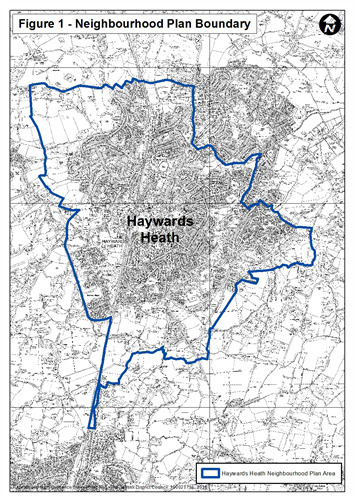 To view the Haywards Heath Neighbourhood Plan - please click here. After four years in development Haywards Heath Town Council's Neighbourhood Plan (which include the whole Town and part of the Ansty and Staplefield Parish along Rocky Lane) was put forward for examination, to test whether it was in accordance with the strategic policies of Mid Sussex District Council's strategic planning documents and the National Planning Policy Framework, on the 21st July 2016. It was determined by the External Examiner ‘that the Neighbourhood Plan reflects the views of the community and sets out a clear vision and suite of policies and proposals for the Neighbourhood Area’. Following recommendations from the External Examiner, the Plan moved forward to referendum on the 1st December 2016 where is was overwhelming supported by those who voted with 90.1 % of those who voted saying YES. To this end, the Neighbourhood Plan was 'made' by Mid Sussex District Council as the Planning Authority at it's meeting of Full Council dated 14th December 2016. Subsequently, there was a six-week legal challenge, which has passed and now means that Neighbourhood Plan is now part if the Planning Framework with planning decisions being made in accordance with the document. In April 2012 local communities were given legal powers under the Localism Act 2011 to develop Neighbourhood Plans. Neighbourhood Planning is the government’s initiative of trying to empower local communities to help make and take forward planning proposals at a local level. The idea being that local people will drive and then help to shape how their local communities grow and develop over the next coming years. The Neighbourhood Plan was completely funded by a £20,000 grant for the Department for Communities and Local Government. Providing for a new Country Park, new Allotments, a new Cemetery, and a new School to be located off Hurstwood Lane. Protecting Clair Hall, the Dolphin Leisure Centre. Protecting Clair Park, Beech Hurst, Victoria Park, Muster Green, the Harlands School Playing fields and other established green areas within the Town. Allowing for the improvement of and enhancements to all aspects of the Town Centre. Allowing for the Bluebell Railway to arrive in Haywards Heath. Allowing for increased provision and facilities at St Francis Sports site. Providing housing for an ever growing population. It also holds policies on the Environment, Sustainable Travel, Transport and Business. “Neighbourhood planning will allow communities, both residents, employees and business, to come together through a local parish council or neighbourhood forum and say where they think new houses, businesses and shops should go – and what they should look like." - A plain English guide to the Localism Act – Communities and Local Government (November 2011) – please click here to read more. In response to this opportunity to develop locally driven planning priorities, Haywards Heath Town Council established a Planning Working Group to work towards developing a Neighbourhood Plan, which once adopted; will be used to make planning decisions and will cover the period up to 2031. How has Haywards Heath’s Neighbourhood Plan been progressed? Haywards Heath Town Council is in the final stages of drafting a Neighbourhood Plan for the town using a strong evidence based approach. The Town Council is in the final stages of drafting the Neighbourhood Plan, which will be published for public consultation in due course. The consultation will be a six week statutory consultation period, and will be publicised on this website, the Town Council notice boards, at the Town Hall and in the press. If you would like to be notified of the consultation period, please register your email or home address with us by contacting the Town Hall. Please note that the supporting documentation below has not changed. Neighbourhood Plan - superceded as above. The following documents have not changed and support the Referendum Plan above. Please find below the documents that make up the Draft Haywards Heath Neighbourhood Plan.